A weekly newspaper set up to appeal to voters who backed staying in the European Union may have its initial four-week run extended. Regional publisher Archant launched The New European to cater for the 48.1pc of Remain voters in the wake of last month’s Brexit vote. Its distribution is also set to be extended beyond its original heartland of Remain-voting areas in London and the South East, to include key locations in Scotland and Wales. 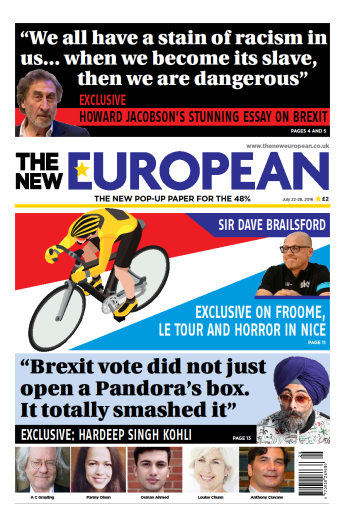 The third edition goes on sale today and includes pieces from Howard Jacobson, Hardeep Singh Kohli and A C Grayling. Archant chief executive Jeff Henry told the Guardian that sales of the launch edition two weeks ago had exceeded expectations. “Sales are better than we had anticipated and it provides us with some confidence that we were right to put out a publishing vehicle based on a zeitgeist,” he said. Jeff said a decision was yet to be taken over whether the title would survive beyond the original four issues. If true, well done, you’ve certainly made monkeys of a few commentators on here. So what about a paper for the majority who voted Out? If it works one way, surely it would do so the other. Just a thought. With just 40,000 copies sold nationally out of the 100,000 copies printed that’s around 0.25% of the remain voters by my reckoning,hardly something to high five each other about is it, rather a case of forecast low, set expectations low then crow when the low expectations are surpassed. Really? Come off it. I’m sticking with my original comments. There’ll be no issue 5. ‘Profitable’. Have the staff costs been factored in? People have been running around like idiots to get this out the door. At least someone has finally realised at Archant that “print is not dead” – really need to sort out your strategy chaps. Forcing web-first on your journalists on the one hand, and hailing print as the new big thing on the other . . . .which is is to be then? A pop-up short term populist print release does not mean print is not dead. You can sell bricks with the EU flag on them at the moment, especially if you already own a brick and paint factory. Print IS dying, not having funeral plan (even for the free pen) is suicide. NellyNorfolk: If print is dying, then it’s being slowly poisoned by the chaps at the top, who can’t decide whether they want to keep it around or not. I go with Hacking Cough: Is it going to be digital, or print, or both? As always with Archant, you have to try to see past the spin. If what other posters here say is true, then with 40,000 sales from a 100,000 print run, and no staff costs factored in, then it could well be “profitable” – just. I tried to buy one in an Archant heartland the day after publication and could not find a copy anywhere, which has got to be a worry. I will try again this week because, as a Remainer, I like the look of the content flagged-up on the front. Grown-up, serious, proper reads. They are getting that bit right, for which some credit must be given. Having been abandoned by what I thought was the real world some time ago, I find myself totally bemused by this project in my new, equally absurd, reality.